Twelve teams competed at the 3rd Annual Wetzikon International this weekend in what for Japan, Switzerland, France and Italy was a warm-up for the World Qualifying Tournament in Lohja, Finland from November 7-12, 2010. Deposed Team Germany skip Jens Jäger, who brought two 'Mainhattan Ice Wheelers' teams to Switzerland, was top of Group A, and faced Group B winners Team Japan skipped by Katsuo Ichikawa, in the final, losing 8 - 1. The Zurich Caledonian Pipe Band led by Ruedi Attinger played at the closing ceremonies, rounding off a very successful tournament that will be repeated October 29-30, 2011. 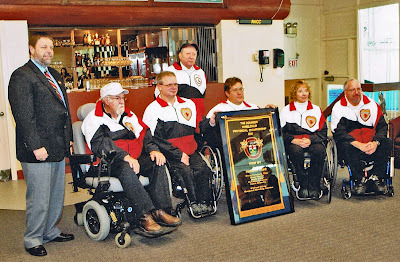 A full slate of 10 competitive and at least 5 recreational teams will be appearing for the 6th Annual Cathy Kerr Memorial Bonspiel at the RA Curling Club in Ottawa, November 19-21, making it the largest wheelchair curling competition in the world. They are competing for $1,400 prize money. The competitive teams, playing in two divisions of five and guaranteed six games are: USA 1 and 2, plus teams from Newfoundland, Quebec and Manitoba, and the five Ontario teams that competed for their provincial championship last season - Cameron, Fraser, Rees, Bradford and Ilderton. Dennis Thiessen, long-time 3rd to Chris Sobkowicz, is skipping his own Manitoba team. Jim Primavera joins Team Bradford, replacing Katie Paialunga who is taking a sabbatical from full time competitive curling. Jim was one of the group of Ontarians chosen to form the original Canadian national team, and has returned from a three year retirement to play with Ken Gregory. For Team Bradford, Debra Karbashewski replaces coach Dennis Moulding, and will share duties with Carl Rennick. Team Fraser has lost the services of Deb Shestalo this year due to medical issues. She has been replaced by Stephan Tom as the alternate. At least 5 teams are expected to play in the recreational division. 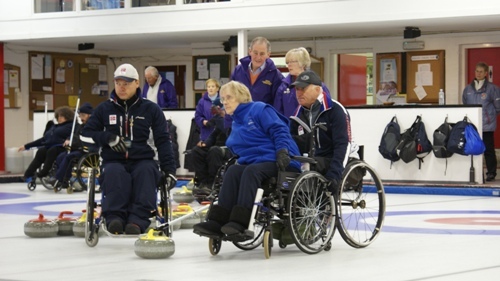 Former Team Quebec coach Al Whittier is bringing a team from his Lennoxville club, with other teams made up from members of the Capital Wheelchair Curling Club. Sonja Gaudet, Canada's double gold medalist, will be traveling across the country to host a demonstration and instruction session at the Silver Fox CC in Summerside PEI. The session will be held on Sunday November 21, from 1.30 to 4.30. Wheelchair users, potential coaches and helpers, family and friends are all welcome. Contact Gayle Johnston at 902-368-1071 for more information. You can download the event poster HERE. Gordon Rainey and Brian Douglas won the inaugural South Lanarkshire Wheelchair Curling Pairs competition, sponsored by Bell's Meat Pies. John Bell was on hand to present to present the trophy in what is hoped will become an annual fixture. 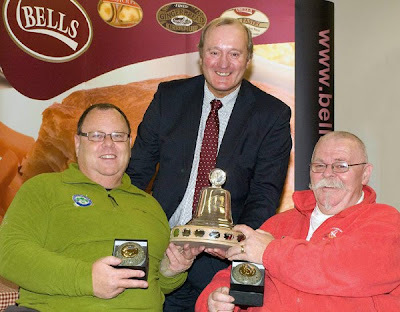 The event was reported by Bob Cowan who reminds me that the Star Refrigeration National Pairs Championship takes place this weekend, October 29-31, at Braehead. Twenty-one teams are taking part, playing in four sections. The teams and the draw are here. Play begins on Friday at 5.30 pm. The top team from each section qualifies for the high road semifinals at 12.45 pm on Sunday, with the final of the national championship scheduled for 2.30 pm. Second placed teams in each section play in a low road. Ian McGillis from the Ontario Curling Association presented Team Cameron with their provincial banner earlier this month. Last Thursday Jim Armstrong and his son Gregory signed agreements with the United States Attorney stating that they would plead guilty to distribution of fake Viagra and Cialis with intent to mislead or defraud. Their separate Plea Agreements can be viewed HERE. They are publicly filed and are a matter of public record. Each agreement is part of a "package plea agreement." This means that if either person withdraws their guilty plea, the "United States will withdraw from both Plea Agreements and will seek an indictment against both parties for all such crimes for which the United States has sufficient evidence." The agreements detail what Jim and Gregory have admitted doing, the range of penalties, and the possible immigration implications, among other things. They also state that Jim and Gregory each "entered into this Plea Agreement freely and voluntarily and that no threats or promises. other than the promises contained in the Plea Agreement, were made to induce (them) to enter this plea of guilty." A report in today's Richmond News suggests that Jim Armstrong pled guilty to charges of distributing fake erectile dysfunction pills with intent to mislead or defraud, because it was a condition of his son Gregory receiving a plea agreement. Reporter Alan Campbell writes: When contacted this week by the News, Armstrong declined to comment on the guilty plea until after the sentence is passed down in January. 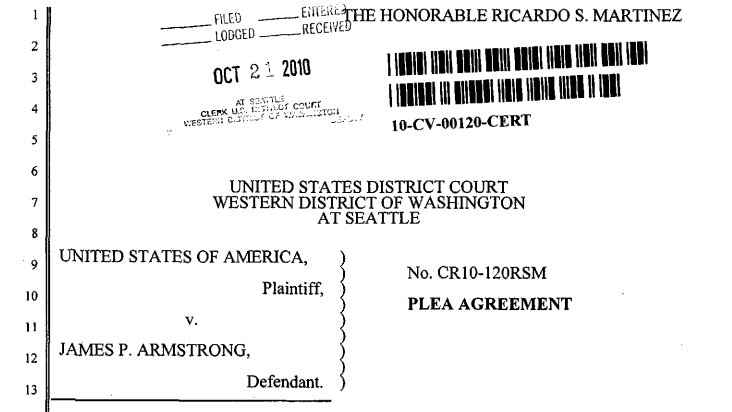 Armstrong did indicate, however, that the U.S. prosecutor’s offer to reduce the charges against his son, Gregory, was conditional on Jim also pleading guilty. This fits with an opinion expressed to me by Gerry Peckham that Jim "was put in an impossible situation and virtually had no choice." The Canadian Curling Association’s chief executive officer, Greg Stremlaw, is quoted by the News as saying he was aware that Armstrong’s plea was struck in terms of his son’s charges. “All of our athletes have a code of conduct and we’ll have to determine if (the guilty plea) impacts the codes of conduct in terms of the national team program." The two separate plea agreements dropped references to trafficking and recommended punishments at the low end of sentencing guidelines in return for guilty pleas and giving up the right to a trial. They are not binding on Judge Martinez, who will issue sentences on January 28th, 2011. See earlier post and comments from October 21st. Michael McCreadie, though taking a break from international competition, remains very much involved in the sport. His latest project is a recently announced Shotmaker Competition, organized through the Scottish Wheelchair Curling Association. The competition asks curlers to complete a series of drills at different locations, the highest scores to be submitted to the SWCA and a prize awarded for the player with the best cumulative score when adding their best result from each of three venues. "The idea is to have a fun competition that raises awareness of shot-making that I think will carry over into regular play. If people practice specific shots their skills will improve, and so will their performance in games," Michael assured me. "At the end of the season, not only will there be a winner, but the twelve best performances will earn an invitation to a Shotmaker event in Kinross." The competition begins in November. You can read full details of the drills and the thinking behind the competition by downloading the aims, objectives and tests. You can register an interest in entering by filling out this form. Though ambitious curlers will already throw a range of specific shots during practice, charted drills allow coaches to gauge progress and compare athlete performances. That is a large part of the thinking behind the Team Canada booklet just released by coach Wendy Morgan to assist in the talent identification and player development program that will be taking place in venues across Canada this season. Athletes who think of themselves as national program candidates, will have the opportunity to display their skills by performing a series of drills described in the booklet. But I remain sceptical about how useful drill totals are in judging potential game performance. For one thing, players on a four person team have lengthy waits between pairs of throws. Every coach I have spoken to say their players have an inflated opinion of how accurate they can be in competition. High practice percentages are rarely seen in game situations. Yes, practice will improve performance and drills can offer a framework that can make practice more disciplined and more efficient. In the context of Michael's shotmaker competiton it can also be more fun. But I would not weight the on-ice performance element of my team selection on drill scores. I'd want to know how curlers can throw under pressure; perhaps by choosing, unannounced, single shots from a game where the curler is told just before they throw that this shot will become part of their record. If all shots are charted, no shot is special and if all shots matter, then none matter. Matches are not like that. Perhaps you'd like to share in the 'comments' how you practice, and what records you keep, and how you can tell whether you are improving as a player. Canadian Paralympic Committee yesterday honoured the Canadian Wheelchair Curling Team with the Best Team Award for winning Canada's second consecutive gold medal in the sport. "These athletes made the Vancouver 2010 Paralympic Winter Games a significant moment in Canadian sport history and reaffirmed to the world that Team Canada is a strong competitor," said Henry Storgaard, Chief Executive Officer for the CPC. "I am so pleased we could honour them here today and give them the recognition they deserve for their incredible accomplishments. By their excellence, they have raised the profile of the Paralympic Movement and have inspired a whole nation." This is the first time CPC has developed its own awards to recognize the athletes at the national level. Sonja Gaudet attended the ceremony and accepted the award on behalf of the team from the CCA's Chief Executive Officer, Greg Stremlaw. 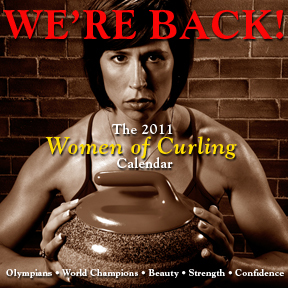 The 2011 Women Of Curling calendar is now on sale with proceeds going to support spinal cord research. 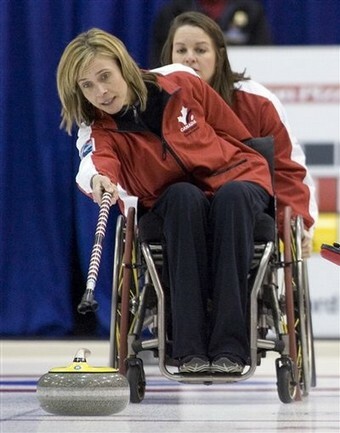 The campaign also hopes to raise public awareness of wheelchair curling. Wheelchair curling reporter and supporter Yayoi Mashimo tells me that wheelchair curling associations in Asia are organizing a regional competition at the end of this month. The spiel will be in Harbin, China, one of only two Chinese cities with curling ice. Teams from China, Korea, and Japan will participate. 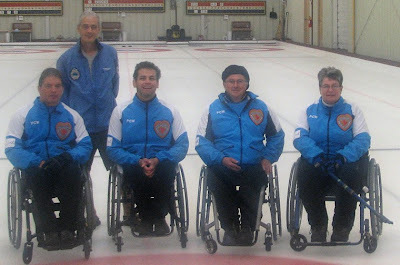 Next month the Japanese national team, from the Shinshu Chair Curling Club, will compete in the World Wheelchair Curling Qualification competition in Lohja, Finland from November 7-12. Reports and photos from last year's Japanese National Championships can be seen HERE. Photos of Team Japan taken at the Vancouver Paralympics by Yayoi's friend Mika Yamaguchi, who sadly lost her battle against cancer this August, can be seen HERE. Deadline for applications to attend Provincial Team Selection Camp is November 12th, 2010. Saskatchewan Curling Association 306-780-9202 or 1-877-722-2875. Five curlers will be chosen to represent Saskatchewan at the National Wheelchair Curling Championship March 20 to 27, 2011 in Edmonton, AB. A CCA Talent ID/Development Camp will take place at the same time. The first in what is planned as a nationwide series of talent identification and development camps is taking place in Calgary, Alberta, this weekend. Team Smart, the 2010 provincial champions, and 4 curlers from Edmonton are taking part. The camps are an attempt by the CCA to reach out across Canada to ensure that every talented curler has the opportunity to make themselves known to those in charge of the national team. As part of that effort, national coach Wendy Morgan has put together a booklet outlining "National Wheelchair Program Expectations" that includes an extensive variety of drills. The drills come with a proviso that there are a 'work in progress' that will be revised and improved as field testing occurs. "We need to ensure they are valid and reflect the current standard of play," says Gerry Peckham, the person in overall charge of Canada's high performance coaching. Local club curler Maria Duncan played lead for Norway as they completed their sweep of the competition at the Kinross International, earning big wins over Wales and Scotland 4 (who gave up a 6 in the 2nd) before finishing with a 7-4 win over Rosemary Lenton's Scotland 1. Norway's full results and some photos can be viewed HERE. Switzerland earned second place on a countback of ends won to break a tie with Scotland 1. Standing - Councilor Willie Robertson and Brian Martin - Ailsa Craig Jewellery - sponsor. Jim Armstrong pleads guilty to "intent to mislead or defraud"
Jim Armstrong, skip of Canada's gold medal winning Paralympic wheelchair curling team, today changed his plea to guilty of distributing pills with an intent to deceive. The trafficking charges outlined in the original indictment are presumably dropped and the trial scheduled for Monday October 25th will not take place. He faces up to three years prison, though the plea agreement, which does not bind the sentencing judge, recommends that he be fined $50,000, perform community service hours and be sentenced to the time he already served in U.S. Custody. Sentencing is scheduled for January 28th before Judge Martinez of the US District Court. Here's part of the United States Attorney’s Office press release. JAMES PETER ARMSTRONG, 59, of Richmond B.C. 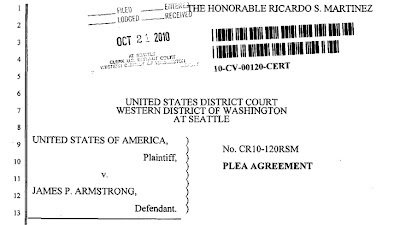 Canada, and his son, GREGORY JAMES ARMSTRONG, 28, also of Richmond, B.C., pleaded guilty today in U.S. District Court in Seattle to selling and dispensing counterfeit drugs with the intent to mislead or defraud. JAMES ARMSTRONG is a retired dentist and was a member of the Canadian Paralympic curling team. The men face up to three years in prison when sentenced by U.S. District Judge Ricardo S. Martinez on January 28, 2011. 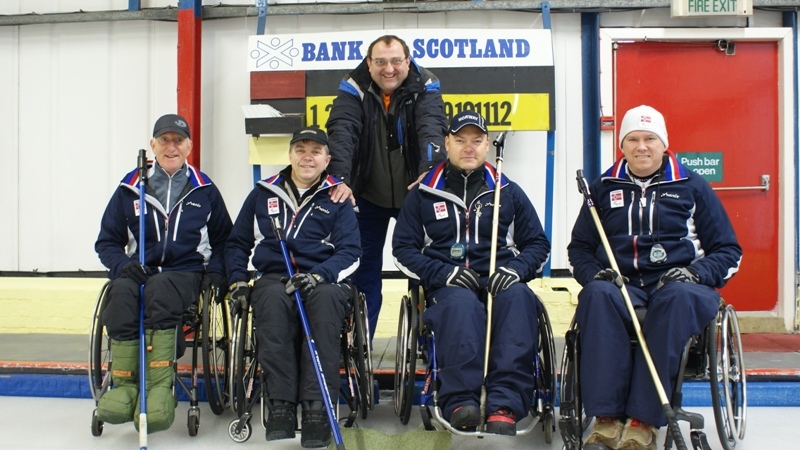 Team Norway, with some new faces and refound enthusiasm after the disappointments of the past couple of years, are tied at 3-0 with Scotland 1 at the midpoint of the Kinross International. Coach Thoralf Hognestad, back in charge after a year away, says the team's spirits are high and skip Rune Lorentsen is enjoying the game again. 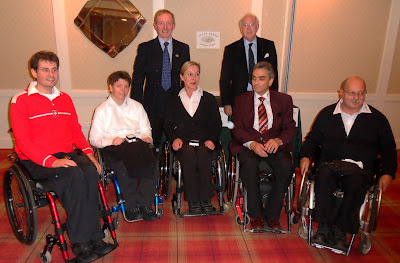 Certainly the results have been decisive: a 7-2 win over what on paper looked a formidable Scotland 2 side (Aileen Nielsen, Tom Killin, Angie Malone and George Ewan), and overwhelming defeats of Scotland 3 and Switzerland. For Norwegian speakers there is a web page with today's action HERE. Norway introduced two new players, Runar Bjørnstad and Paralympic skiier Per Fagerhøi, though they had to borrow local club player Maria Duncan as they were unable to travel with a female player. Runar and Per are alternating games in Kinross, but next month at the Prague Open, Rune and Jostein will play with two more newcomers; Tone Edvartsen and Terje Rafdal. Rosemary Lenton, a late cut from the 2010 British Paralympic squad, has skipped Scotland 1 to a 3-0 start and will play Norway in the final draw Thursday at 3pm local time. The teams and schedule can be found HERE. Bob Cowan reminds me that the 3rd Annual Kinross International got underway today. Last year it attracted six Paralympic squads in a nine team field but will still host seven teams, with Switzerland and Norway joining Wales and four Scottish teams for play through Thursday. Wheelchair curling in Northern Ontario adds another venue with Sudbury CC hosting wheelchair curling Sundays beginning October 24. Call 705-560-3309 for more information. Team Lessard, who have reorganised this season and now play out of the Magog CC under new coach Germain Tremblay, have started their own blog. The holiday weekend has delayed the start of the Lakeshore CC wheelchair curling sessions for a week. They will begin Saturday October 16t, 2.45 till 5pm. Cost is $4 and no experience is necessary. Able-bodied friends who are prepared to use a delivery stick, are also welcome. As mentioned a couple of days ago, the newly accessible Nanaimo Curling Centre has programmed wheelchair curling for Wednesday mornings, and six wheelchair users showed up on the first day. "Three were first timers and three had some experience," club manager Denise Wood told me. "Two have decided to play in one of our regular curling leagues, and we're hoping to attract nine or 10 regulars as the season progresses." As for the change from club to centre, she explained: "The design (above) was a result of local design students presenting their concepts to our membership." Aileen Nielsen with Hammy Mcmillan Snr. 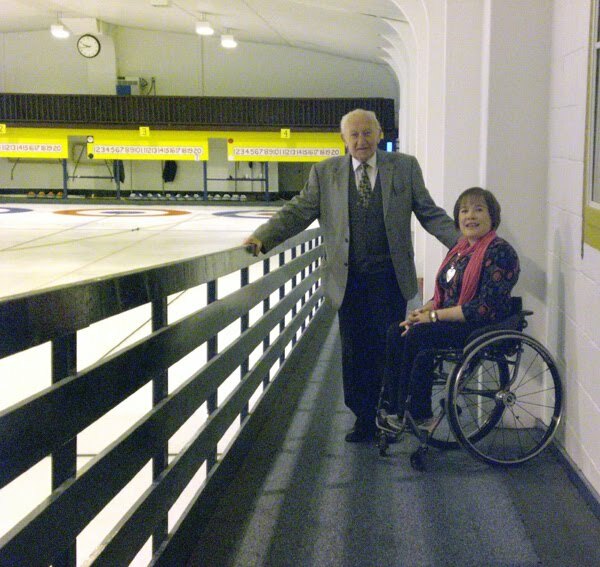 Stranraer Ice rink, which celebrated its 40th birthday this year, now has a ramp that extends from the bar to the changing rooms, making the entire facility wheelchair accessible. Michael McCreadie told Bob Cowan: "It is quite long and goes from the top of the stairs at the bar down to the middle door leading to the changing rooms. As wheelchair users we can go independently anywhere on the ice rink. 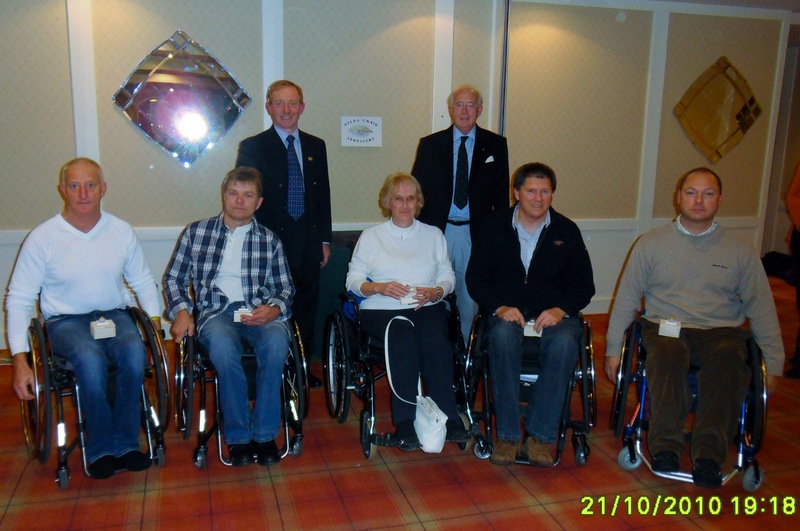 Congratulations on their foresight and no doubt when word gets round more wheelchair users will use this great venue." The Richmond Centre for Disability, an active supporter of wheelchair curling for many years, had hoped to celebrate their 25th Anniversary International with a big field for their December spiel. They have extended the application deadline to October 15th, hoping to add at least one more team and reach the minimum five entries needed to run the tournament with four person teams. The organizers hope the event will run as a 2on2 if no more entries are received. The competition runs from December 1 - 4, with practice ice available November 30th. Entries are $250 for up to 12 teams with half payable by the registration deadline of October 15th. For more information and a registration form contact Rich Green. The eight-sheet Nanaimo Curling Centre (the CCA has been trying to get clubs to rebrand as centres, hoping to sound more inclusive) is now fully accessible to wheelchair users after the addition of an elevator. Time has been set aside for wheelchair curling on Wednesday mornings, though there's no reason why wheelchair users should not do what the general public does; jump right in and join a "fun" league, even if you lack experience. 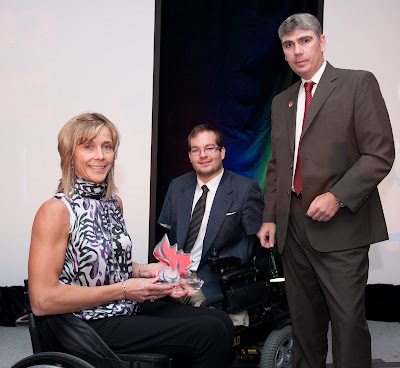 The club manager is Denise Wood who'll be happy to arrange ice time for wheelchair users to try the sport. I get frequent emails asking whether I know the dates of this or that wheelchair curling event. 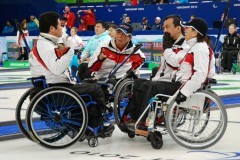 When I am given the information, I put it on the calendar page of the wheelchaircurling.com website. If you know of an event that may be of interest to those who follow wheelchair curling, please send it to me at eric@wheelchaircurling.com and I will make it available to everyone.